The bull trout is one of Montana’s most unique fish. They can grow to over three feet and can weigh over 20 pounds, and depend on cold, clear water. Bull trout are excellent indicators of water quality, and are often considered an “umbrella” species. That is, if water quality is healthy enough for bull trout, it is likely healthy enough for most other, less-sensitive aquatic species native to Montana. Their sensitivity to adverse water conditions, coupled with the competition posed by non-native fish such as the brook trout, have caused bull trout numbers to slowly decline across the northwest, and they were listed as a threatened species under the Endangered Species Act (ESA) in 1998. On January 13, the U.S. Fish and Wildlife Service proposed to revise its 2005 designation of critical habitat for the bull trout. Under the ESA, critical habitat identifies geographic areas essential for the conservation of a listed species. Critical habitat designations provide extra regulatory protection to areas that may require special management considerations, and the habitats are then prioritized for recovery actions. The critical habitat designation does not affect land ownership, does not allow government or public access to private lands, and does not impose restrictions on non-federal lands unless federal funds, permits or activities are involved. However, it alerts landowners that these areas are important to the recovery of the species. In the Clark Fork Basin, as restoration continues on mining-impacted ecosystems, maintaining quality bull trout habitat can be seen as a final hurdle; if bull trout return to some of the historically damaged areas of the Clark Fork watershed, then we can safely assume that restoration efforts are succeeding. In total, the Service proposes to designate approximately 22,679 miles of streams and 533,426 acres of lakes and reservoirs in Idaho, Oregon, Washington, Montana and Nevada as critical habitat for the wide-ranging bull trout. The proposed revision comes after extensive review of earlier critical habitat proposals and public comments. The Service voluntarily embarked on this re-examination to ensure that the best science was used to identify the features and areas essential to the conservation of the species. 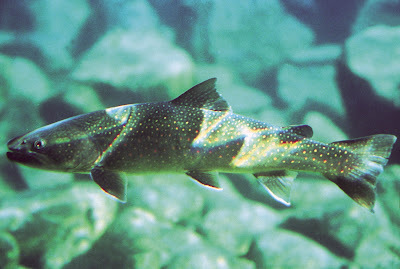 In Montana, additional bull trout critical habitat is proposed for the Kootenai, Clark Fork and St. Mary River Basins. Under the 2010 proposal, most tributaries of the Blackfoot River, Flint Creek and the Clark Fork River would be considered critical bull trout habitat. Most of the Blackfoot, as well as sections of Flint Creek and the Clark Fork, were previously designated as critical bull trout habitat in 2005. The Clark Fork and Flathead watersheds were historically important to bull trout prior to the heavy impacts caused by human developments such as hydroelectric dams, other manmade barriers, and historic mining. Today, those river systems are being reconnected through dam removal (Milltown Dam), improved fish passage (Cabinet Gorge, Noxon Rapids, Thompson Falls), and improved habitat (Clark Fork restoration projects). The Clark Fork River is particularly important, as it provides a migratory corridor for bull trout from Lake Pend Oreille and the lower river to access the Blackfoot, Rock Creek, and potentially Flint and Warm Springs Creeks, where significant populations of bull trout remain. To do our part to help bull trout recover, anyone fishing in western Montana should repeat the mantra: No Black, Put It Back! Bull trout are most easily distinguished from other Montana trout by their top fin; unlike other trout, the bull trout have no black spots on their top fin. They are also characterized by a slightly forked tail and pale yellow, orange and red spots on the body. As a threatened species, bull trout should be released immediately if caught. To assist in identifying Montana trout, CFWEP, Montana Fish Wildlife & Parks, the Sierra Club, and the University of Montana distribute free pocket fish ID guides. Contact CFWEP for your free guide before heading out on the river. The Service will accept public comments on the proposed critical habitat until March 15, 2010. For information on how to submit a public comment, and for more on the proposed critical habitat designation, visit www.fws.gov/pacific/bulltrout. For a direct link to a map comparing existing bull trout critical habitat with proposed 2010 habitat, click here. You can learn more about bull trout in Montana at the Montana Field Guide from mt.gov. 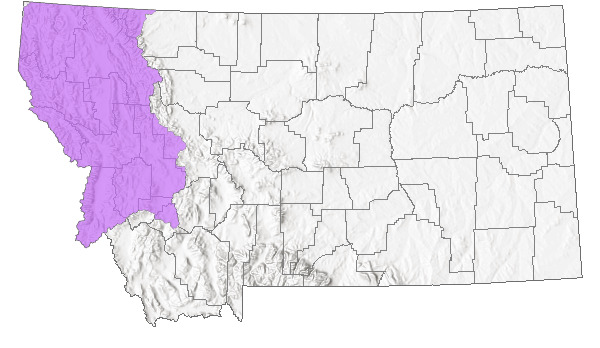 The above map shows bull trout range in Montana. 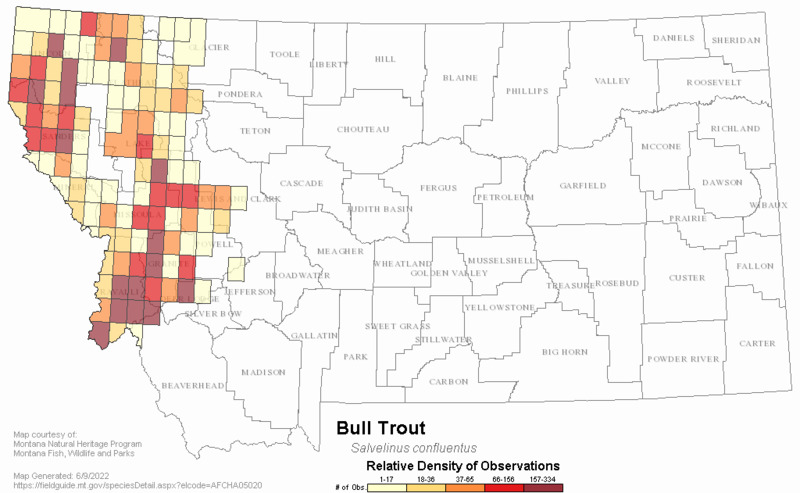 The above map shows bull trout density in Montana.